EAT WITH ME: Pink...it's my favorite color! 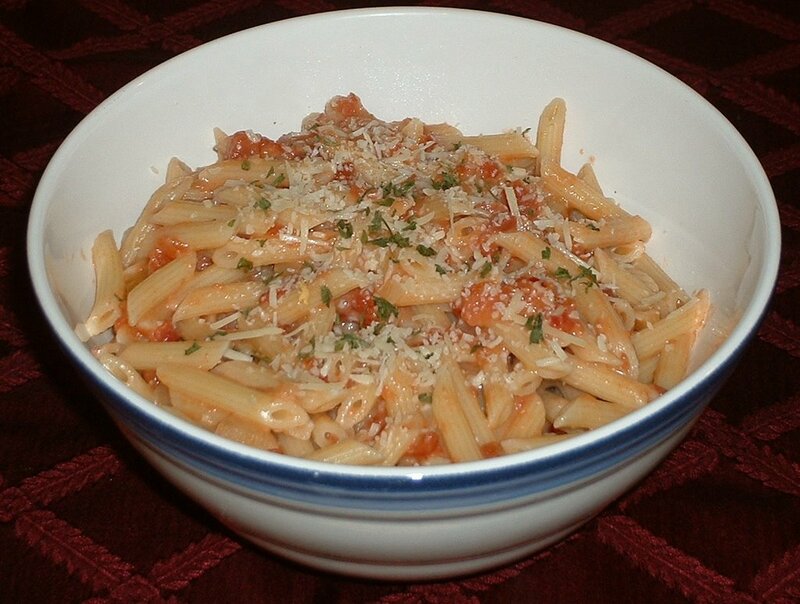 Just over a week ago, Katherine at the ToastPoint blog put up a post on Penne alla vodka. Oh Yeah! I have made variations of this decadent dish over the years, no matter how it is made, it is always a pleasure to have. For those who haven't had or made Penne alla Vodka, it is 1) penne and 2) a very simple tomato sauce with a touch of 3) cream and 4) vodka. The tomato and cream make a velvety sauce that coats your mouth with a full lusciousness that is to die for. Adding the vodka kicks up a natural heat level, warming your lips, throat and belly. Below is the recipe as found on ToastPoint! Put on a large pot of water to boil for the pasta. Add to the oil and cook until soft and just beginning to caramelize, stirring occasionally, about 15 minutes. Cook over medium-low heat for another 15-20 minutes. Stir to combine, then remove from heat. Cook until very al dente, then drain and return to the pan. I know it seems odd to add that much vodka to your pasta, but it really works. If you're squeamish, you can add the vodka to the tomato sauce to cook off the alcohol, you wimp. Stir until the pasta is coated and strangely fragrant buttery vodka fumes begin to rise enticingly from the pan. Tip in the tomato sauce and stir to combine. Serve immediately, with grated parmesan cheese for sprinkling on top. Tonight when I made this, I only had 1 can of tomatoes, so I 1/2 everything else. I also only had "mini penne." No worries. All was good. For a touch more added heat, I added a pinch of red pepper flakes with the onions in the very beginning. I used two garlic cloves, minced, added with the onions as well. When my pasta was done, I drained it, put it back in the pot and added the butter. I then took the sauce, as prepared above, quickly stirred in the vodka, then poured it into the pasta. I did this just to make sure the sauce was evenly stirred together, then allowing it to evenly coat the pasta. Next time I make this, given the advanced planning, I would see about getting some fresh basil to add in at the last minute, just for a little something extra! But as it, it's perfect! Oh, that looks sooooo good! I have soup on right now for tomorrow's dinner but would love to swap it out for this. Thanks for posting. Perhaps, I can make this on Thursday night and let you know how it goes. I'm glad Nigella and I could be of service! Oh, that looks so yummy for my tummy! I've never had a vodka sauce, but I've always been tempted. Perhaps I shall try it soon! I finally got around to making this tonight! To Die For!! I pretty much followed the recipe as is, but cut the recipe in half, as I am only one person. ;) I also added the garlic, and a little bit of fresh ground pepper. I ate too much, but it's sooo good!